The ITU has recently published figures noting 2.7 billion internet connections globally, and today Akamai has released some numbers pointing to how fast those connections actually are. The company, a specialist in traffic optimization, says that we have now reached a tipping point of sorts: half of all connections made to its network are currently running at 4Mbps or higher — a sign that “universal broadband” is finally starting to become not just an ideal, but a reality. The figures come from the latest installment of Akamai’s State of the Internet report, which crunches numbers based on some 1 billion connections made into Akamai’s traffic optimizing network and also covers other subjects like security trends and mobile internet usage. That will likely sound like a blast from the connection past for some readers, because while currently the global average connection speed is 3.3Mbps, Akamai notes that the leading nations are seeing speeds that are significantly faster. 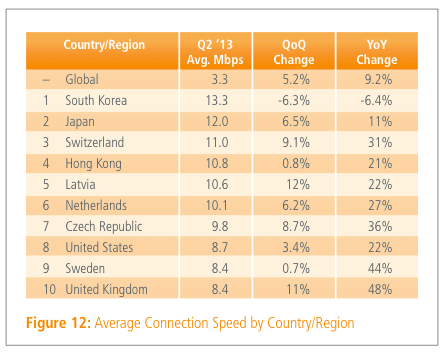 Top of the list, consistent with the ITU’s reporting, is South Korea, which Akamai says is clocking average internet speeds of 13.3Mbps — although that is actually down by 6.4% over a year ago. Indeed, when it comes to what regions and categories are seeing the most attacks, it looks like the crime follows the money. The Americas, and the U.S. specifically, saw the most DDoS attacks in Q2, and enterprise services are proving to be the most vulnerable, with e-commerce coming in at a close second. Breaking that out more, within enterprise, business services are taking the lead in DDoS attacks: Akamai says that this is the first time they’ve been in first position. Akamai notes that this was influenced specifically because of malicious activity in the Asia-Pacific region specifically. Additionally, this is the first time that pharmaceuticals and healthcare have made their way into the rankings — one of the downsides in the going growth of e-health services (and something for those companies to get more aggressive in trying to guard against as they grow). The commerce threat, like the one in e-health, also underscores the ongoing trend that of e-commerce and how it is growing in ubiquity. Akamai notes that unlike business services, these attacks happened worldwide and were not concentrated in a particular region. When it comes to what kinds of attacks are the most popular today, those targeting the http port (80) remain the top choice for malicious hackers, accounting for 24% of all attack traffic. Worryingly, https, SSL-based attacks (port 443) are growing and are 17% of all attack traffic (not exactly as secure as you would imagine). Port 445, Microsoft-DS, once the most popular for attacks, is at 15% of all traffic but growing faster than the top two. For those looking for safer pastures. Port 8080, http alternate, is at 1.4% of all attack traffic. 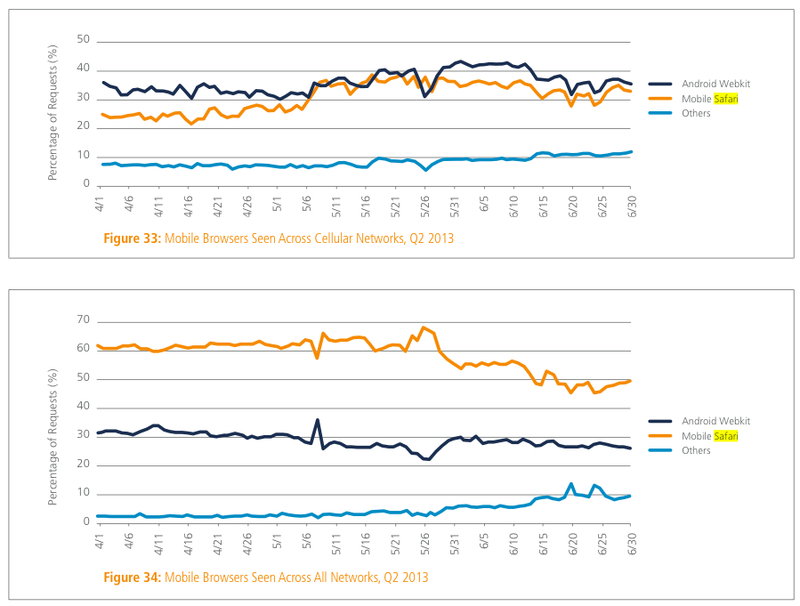 Akamai tracking of which browsers are being used the most from mobile devices underscores two of the bigger trends in mobile adoption: Android may be the world’s most ubiquitous browser, but Apple’s devices are still more popular in terms of usage overall. Akamai notes that when it looks at access from mobile devices over cellular networks, Android Webkit is just edging out Mobile Safari, with other browsers trailing quite a ways behind. Webkit, it notes, accounted for 38% of requests, while Safari 34%. When usage was tracked across cellular and other networks (for example, broadband via WiFi), Safari shot into the lead, with 54% of all requests and Android Webkit at 27%+. This could partly be attributed to iPad usage; perhaps also just to the fact that while iOS owners may be proportionally smaller than Android device owners, when you take into account all kinds of usage, they are simply just using their devices more. Akamai also notes that average connection speeds on mobile networks are now ranging from between 9.7Mbps to 0.5Mbps. Akamai doesn’t track this itself but notes that Ericsson says that mobile data traffic volume grew 14% in the last year, while voice traffic was up by only 5%.